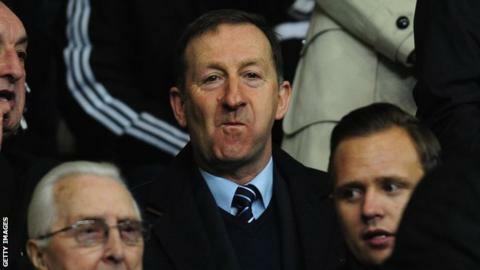 Swansea City chairman Huw Jenkins has said any investment in the club would need the approval of supporters. Jenkins confirmed in his programme notes for the game against Arsenal that the club has held talks with parties about the possibility of investing in the Swans. Swansea's supporters' trust, which owns 20% of the club, has previously voiced its concerns about foreign ownership. "There are a number of clear questions that need to be asked," Jenkins wrote. "Will the current board of directors continue as they are forever? "Can Swansea City operate in the same way for the next 10 years or so as it has in the past? "Will standing still and protecting what we already have be enough for us to compete in the future? "This needs to be considered in more detail before any of our supporters can decide if the thought of a new person or people sitting on our current board of directors to offer help and opinions on the future running of our football club is a good move or not. "My reading of that is he [Jenkins] is starting to try and convince Swans fans because as he says they cannot continue as they are forever. "Swansea City are now a stabilised Premier League club and that has whetted the appetite of the fans for more. "How do they get more and how do they move on? It means more investment." Since then, Jenkins and the board, which includes a fans' representative, have steered the club to its current position of sixth in the Premier League table. But Jenkins said in September that Swansea were "miles behind" most of their rivals in terms of commercial income. The Swans are understood to be talking to American millionaire John Moores, an entrepreneur who previously owned the San Diego Padres Major League Baseball franchise.